I completely forgot that after this issue there is a one-shot special issue that concludes the story. So this is the next to last issue. Amy goes back to Earth and horrible, horrible things happen. Plus, Topaz gets a haircut. A horrible, horrible, haircut! 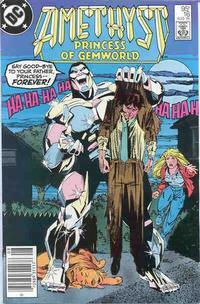 The issue opens with a single panel showing the Gemworld nobility crawling from the wreckage of Castle Amethyst. Prince Topaz tenderly cradles Prince Moonstone in his arms, Lord Garnet looks like he has broken ribs, and Lady Turquoise shifts a rock off of herself. The Diamond Priest is dead. They all wonder where Amethyst is. 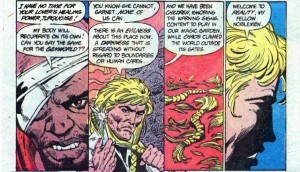 Topaz hacks of his hair with a dagger and says that they need to wake up to reality. Amethyst falls through a magic portal into her bedroom on Earth. She wants to forget everything about the Gemworld. Taffy runs to greet her. 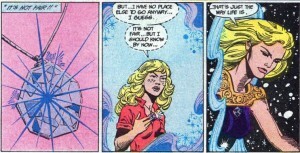 Emmy stands in the doorway of the room, saying that it has been so long since Amy was on Earth. Amy immediately asks about school gossip, Madonna, and Miami Vice. Emmy keeps trying to tell Amy something, but Amy is totally distracted. She’s even more distracted when she realizes that she’s not blind on Earth. As the girls head downstairs and see Mrs. Winston, it is clear what Emmy was trying to communicate. Mrs. Winston calls Emmy “Amy” and treats her like her daughter. She refers to Amy as “Amy’s friend Emmy” and invites her for dinner. 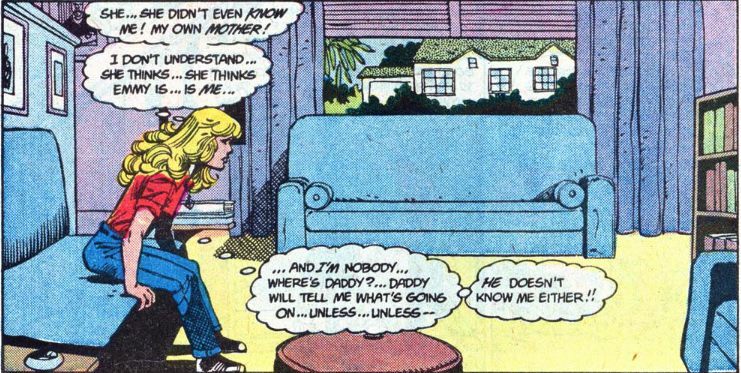 Amy sits on a couch totally stunned, wondering where her father is and if he’s forgotten her too. Back on the Gemworld, The Child decides to bring White Opal’s kingdom down to the ground. It falls out of the sky and collapses into a pile of rubble. White Opal crawls out. 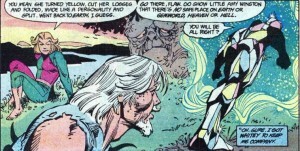 The Child says that since he missed his chance to punish Dark Opal, he’ll torture White Opal instead. White Opal says “I cannot stay on this soil. 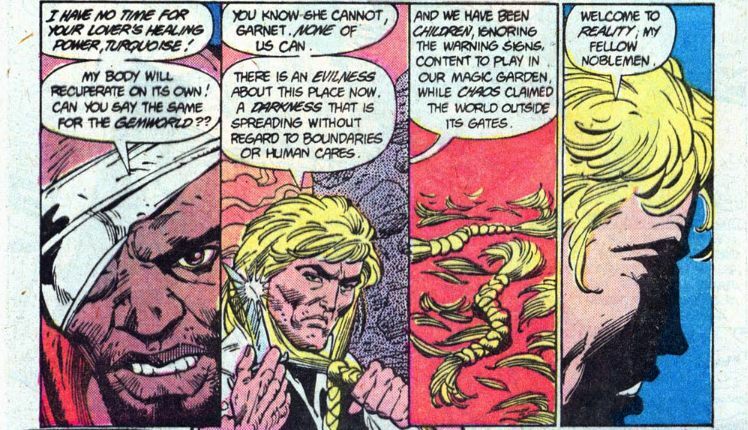 Through no control of my own, I will eventually curse the Gemworld and you along with it.” The Child says “That’s already known, Whitey. You were just the sign, I am the cause, got it?” The Lords of Chaos observe The Child. Some of them are impatient with his progress, but they will wait to see what he’ll do to the Gemworld. Amy, Emmy, and Mrs. Winston are sitting around the table. Mrs. Winston goes to get some milk and Amy angrily demands an explanation of her mother’s amnesia. Emmy says that somethings wrong with Amy’s mother but she doesn’t know what. 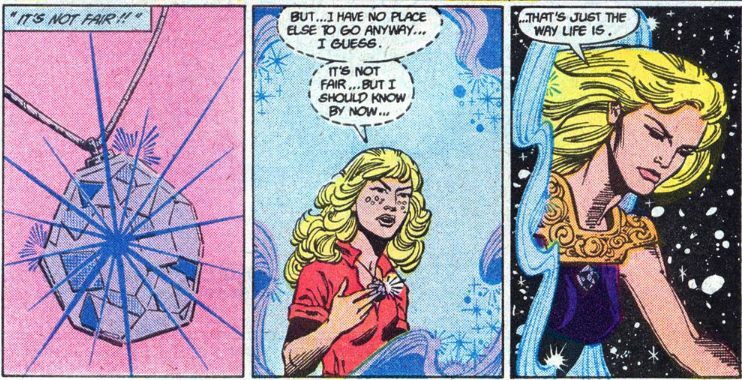 Amy accuses Emmy of using magic. Mrs. Winston is alarmed at the raised voices and Emmy says that they are practicing a school play. 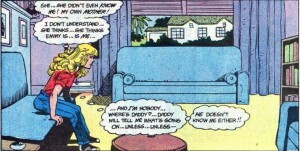 Amy runs to her room, saying that Taffy’s her only friend. She wants her mom. Amy rips the amethyst pendant off her neck and throws it across the room. Taffy goes to look at it and Amy turns her out of the room. Amy sobs into her pillow. The Child and Flaw are still hanging out with White Opal. Opal begs for a drink of water. The Child asks Flaw “Did you happen to catch sight of our favorite princess back in purpleville?” Flaw says that she escaped. 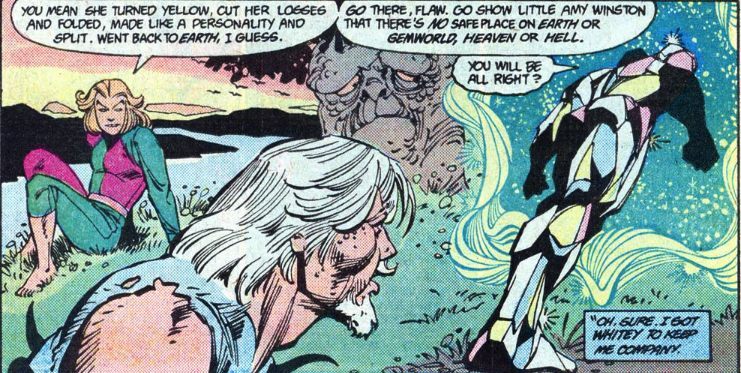 The Child tells Flaw to go to Earth to find Amethyst. A woman’s voice yells “Herb!” It is Mr. Winston’s student Gina. Flaw is amazed that another woman is interested in Mr. Winston. He throws him down on the ground, thinking that he might not serve his master by killing Amy’s father after all. Amy realizes her father was having an affair. Mrs. Winston comes out of the house and sees Mr. Winston with his girlfriend. 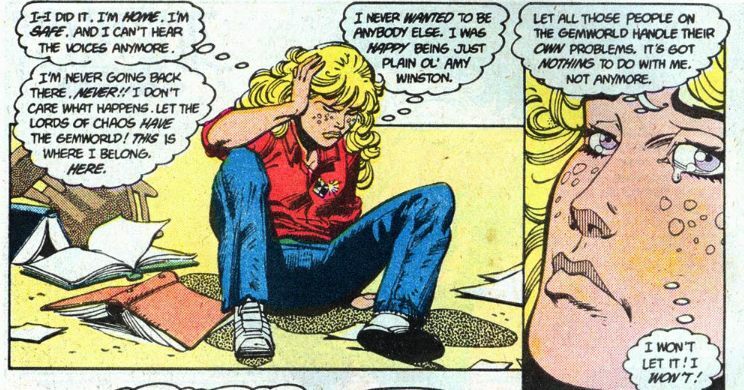 Amy tries to talk to her as Emmy, saying that there has to be a logical explanation for what Mr. Winston is doing. Mrs. Winston walks back to the house. Amy breaks down and says “Mommy, come back! Please! I need you! I can’t go on like this!” Mrs. Winston says she can’t believe her daughter has such a cruel friend who would tease her by calling her Mommy in a situation like this. She says “I think it’s best that you go home now, Emmy, and don’t come back.” Amy is stunned. Amy looks in at Emmy sleeping in her room. She thinks that Emmy is a princess with a birthright too, but no one is coming after her to make her face her responsibilities. Amy puts on her pendant, thinking that life isn’t fair. She has no place left to go but the Gemworld. Next time: Finally the conclusion! This entry was posted in comics and tagged Amethyst Princess of Gemworld on 5/12/2009 by Anna.